When President Obama delivers the annual State of the Union address tonight, he'll be in hostile territory. Over the last year, congressional Republicans prevented all of his major legislative pushes — immigration reform, gun control, and the Employee Nondiscrimination Act — from becoming law, then celebrated by shutting down the government. Democrats, meanwhile, have unexpectedly been placed on the defensive thanks to the botched Obamacare rollout, and members of both parties have raised serious questions about the National Security Agency’s domestic surveillance programs. 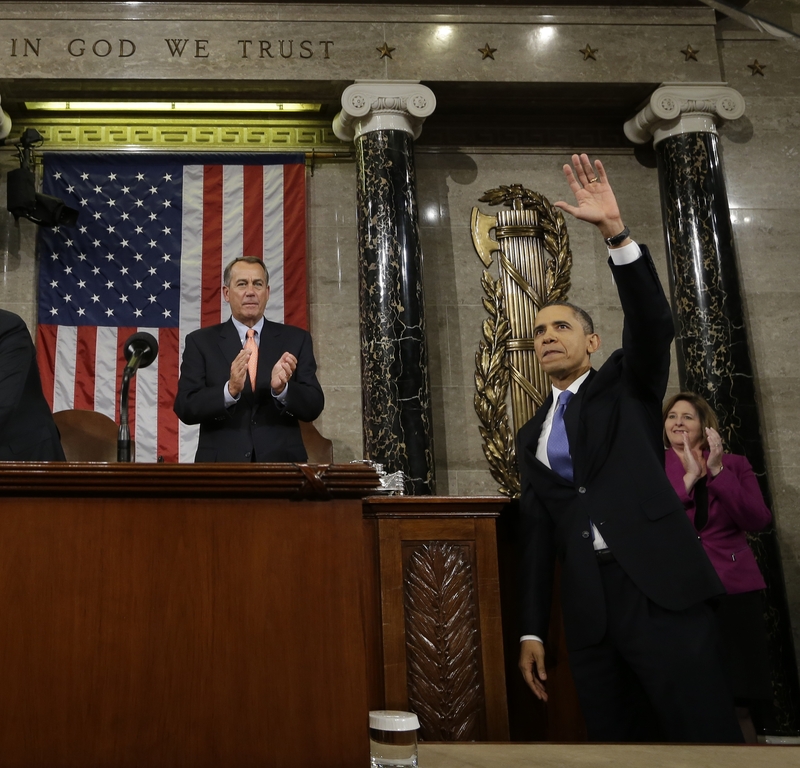 So, what can we expect from the State of The Union address? Well, normally, a president uses the SOTU to lay out his legislative and foreign policy agenda for the next year. But Congress is intent on blocking Obama’s every move, and there are no obvious foreign entanglements looming on the horizon, which raises the question of what, exactly, the president will talk about Tuesday night. We won’t know for sure until he speaks — or rather, until the speech leaks — but we’re guessing it'll contain a couple of the following things. The SOTU officially starts at 9:00 pm EST, but that doesn’t include all the time the president will spend shaking people’s hands on his way to the stage. Everybody in that room, regardless of party, wants to say they shook hands with the president, and you can be sure they’ll take advantage of the opportunity. So if you’re a couple of minutes late to the speech, don’t worry, because all you’ll miss is glad-handing. One thing is almost certain: Obama will unveil some policy initiatives that don’t rely on Congressional action. This usually takes the form of executive orders — unilateral domestic initiatives the president can issue sans congressional approval — but it could also refer to some manner of foreign policy intervention. Given Congress’s obstinacy, it would have been reasonable to assume that Obama would do this anyway, but it’s actually been reported this will be his approach, and the White House has confirmed it, at least when it comes to raising the minimum wage: Obama will sign an executive order mandating that employees working for federal contractors (big caveat there) will be paid at least $10.10 an hour. But while executive orders have the nifty advantage of being able to fly right over Congress’ head, they have one serious limitation: They can only affect policy within the functioning of the executive branch. So while Obama could issue an executive order mandating equal pay for women who work in the federal government,* for example, he couldn’t issue one requiring private businesses to do the same. But what areas will those policies address? It’s a time-honored tradition for Republicans and Democrats to sit on opposite sides of the room during the SOTU, like girls and boys at a middle school dance. Three years ago, Republicans and Democrats sat next to each other in a symbol of unity (which was ironic, since there’s zero unity between the parties when it comes to actual policy,) but that’s faded as of late, and Congress will most likely be back to full partisanship by the time Obama takes the podium. Democrats have made it clear that they plan to make income inequality a signature issue for the next couple of years, and that will most likely occupy a good chunk of Obama’s speaking time Tuesday. But although it hasn’t been as loudly advertised, there’s good reason to believe that the president may focus gender issues as well. For one, he’s just announced the formation of the Task Force on Protecting Students From Sexual Assault, and presidents always like to tout their latest initiatives in big speeches. In addition, the topic of income inequality dovetails organically with a lot of women’s issues anyway, with the pay gap being only the most obvious example, so it’s only natural to talk about the two in the same breath. Lastly, even excluding the Affordable Care Act, the administration has done a lot for women over the past five years. That includes the Lily Ledbetter Fair Pay Act, the appointment of several feminist judges to very powerful courts, and lifting some barriers for women in the military (Republicans, meanwhile, are literally teaching their members how to not sound sexist, which more or less sums up where the GOP is at.) While the SOTU isn’t supposed to be a political event, it inescapably is, and considering the bleak outlook for Democrats in the midterm election later this year, they have every reason to keep doing what’s been working for them and announce some more pro-woman policies. This is Obama’s bread and butter. In a glorious middle finger to Russia’s culture of homophobia, the president decided to put several openly gay athletes on the official U.S. delegation to the Olympics contest in Sochi next month. Now, Michelle Obama has revealed that she’ll be bringing Jason Collins, the NBA player who came out last year, as one of her official guests to the SOTU. The First Spouse’s guests are often a small hint as to the substance of a president’s State of the Union speech, so you can bet Obama will find some way to knock Putin’s shameful encouragement of hate crimes and anti-gay sentiment in Russia. You can accuse Obama of a lot of things, but lacking commitment to healthcare reform isn’t one of them. At every turn, the president has had opportunities to abandon this pet project of his. Shortly after taking office, his closest aides advised him to focus on something else. After Scott Brown’s unexpected victory in the Massachusetts Senate race imperiled the legislation, House Democrats wanted to abandon healthcare reform altogether. Last year, after opposing the legislation in lockstep for the past four years, Republicans went so far as to make the continued funding of the government contingent upon defunding the Affordable Care Act. Every time, the president has kept calm and carried on. The rollout of Obamacare has Republicans squealing with delight and red state Democrats shaking in their boots, but as far as setbacks go, the law has seen far worse. The president almost certainly sees the SOTU as an opportunity to mount a full-throated defense of the Affordable Care Act, so when he takes the stage Tuesday, expect to hear an acknowledgement that the law isn’t perfect ... followed by much longer section on why it’s great. *Actually, Obama couldn’t do that, since President Kennedy already signed that order.